Vibia Perpetua, together with her friend and slave Felicitas, and Saturus, Revocatus, Saturninus, and Secundulus died on (or before) March 7, A.D. 203, in Carthage, North Africa, during the persecution of Christians under Emperor Septimus Severus. 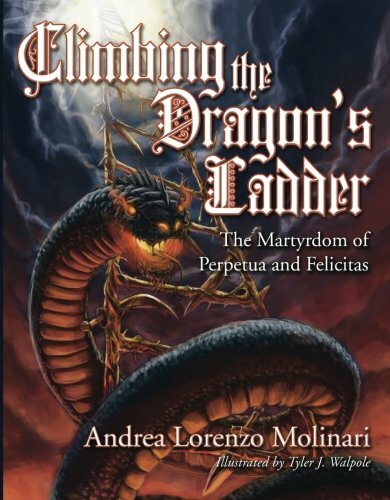 For the original collector of Perpetua’s diary, Perpetua was an illustration of Acts 2:17, Pentecost, and the Holy Spirit still falling upon women (as well as men) and granting visions.2 The journey to her martyrdom includes numerous visions: climbing the dragon's ladder to the heavenly shepherd, seeing her dead brother Dinocrates in trouble and then healthy, Perpetua battling the devil (in the form of an Egyptian), and Saturus' journey to the youthful "white-haired man." Molinari takes the original brief Martyrdom of Perpetua and develops a lengthy and positive picture of Perpetua and her Christian brothers and sisters, developing the characters of the persons in the original account. Twelve pages 3 have been expanded to 278 pages; thus, Climbing is clearly historical fiction. As Molinari hopes, it is indeed "in the realm of what is reasonable and possible" (xiii). It begins with an introduction to the young man who will collect Perpetua's diary, giving a detailed feel to the archaeology and customs of the day. Molinari relates the different stages of arrest: house (ch. 1), gladiatorial school (ch. 6), military prison (ch. 21), and, finally, execution at the amphitheater in Carthage (ch. 29). A baffling aspect of the original Martyrdom is that Perpetua is described as "a young married woman about twenty years old.... She had ... an infant son at the breast" (Martyrdom 2). Her husband is never mentioned explicitly. Molinari develops the character of Saturus as the missing husband, creating a delightful romantic first meeting in the arranged marriage (ch. 3) and a triumphant proclamation of Saturus' faith before the accusing judge after he makes certain the state does not take his estate (ch. 14). Particularly poignant is Molinari's beautiful description of the support of all believers during a martyrdom: "We are here, struggling with you," says the deacon Pomponius to Perpetua in her vision. "What do you mean, 'we'?'' she asks. She looks up into the stands to see a huge crowd of white-robed martyrs exhorting her to be "strong and of good courage" and "brave" (238). We are reminded of the "great cloud of witnesses" in Hebrews 12:1. In contrast, Perpetua’s description of her father is an apt warning for all of us: "Power, ability, prestige, worldly importance, these things are like sand we try to grasp in our hands but that inevitably slips through our fingers.... we are prepared to stop at nothing, to destroy anyone, just to build our house of sand" (246). What critical issues does the Martyrdom present? Some scholars posit that "it is possible that Perpetua and her companions were Montanists," since Tertullian (a Montanist) wrote the introduction.4 Molinari instead presents Perpetua as completely orthodox. I would agree. In contrast to Perpetua, Montanus thought he was the Paraclete predicted by Jesus. The Montanists claimed to have been martyred for the faith, but Apolinarius said none of them was arrested or killed for the faith. According to Apollonius, they preached fasting and the annulment of marriage, but, in reality, lived off robbing others (Eusebius, Church History 5.14-18). The only surprising aspect of Perpetua's visions is her "obligation" to pray to the Lord for the end of the suffering of her deceased seven-year-old brother Dinocrates (Martyrdom 7), who is in some kind of limbo, still diseased, unable to drink water. In contrast, Jesus taught that between the tormented rich man in Hades and the beggar Lazarus is "a great chasm" that no one can cross (Luke 16:19-31), and Jesus never asked the living to pray for the dead. Perpetua may not have been perfect in her theology, yet she is a model for all of us. As Molinari summarizes, Perpetua "is looked to by her fellow Christians for spiritual leadership, who stands before the pervasive male authorities (i.e., her father, the Roman procurator) and simply refuses their attempts to stifle her voice. Yet she is not an angry woman. She doesn't hate men. Despite her clashes with her father, her love for him is undeniable" (xii). No wonder Molinari named his own daughter "Perpetua"! 1. Patricia Wilson- Kastner, et al., A Lost Tradition: Women Writers of the Early Church (Lanham, Md. : University Press of America, 1981), 3. See also R.E. Wallis, "The Martyrdom of Perpetua and Felicitas," Ante-Nicene Fathers 3, ed. Alexander Roberts and James Donaldson (Peabody, Mass. : Hendrickson, 1885), 699-706. 2. Martyrdom of Perpetua 2; Wilson-Kastner, A Lost Tradition, 19. 3. Martyrdom of Perpetua in Wilson- Kastner, A Lost Tradition, 19-30. 4. Justo Gonzalez, The Story of Christianity I (New York, N.Y.: Harper and Row, 1984), 83; Ronald A. N. Kydd, Charismatic Gifts in the Early Church (Peabody, Mass. : Hendrickson, 1984), 69-70; Wilson-Kastner, A Lost Tradition, 2 ("it reflects strong pro-Montanist tendencies") versus 17 ("there is no positive evidence of Perpetua’s personal affiliation with the sect. ...the Montanist aspect of the work seems to have escaped the notice of Augustine and many of the early Fathers").